The Mexican Optics and Photonics Meeting is a three-days-long conference organized every two years by the Academia Mexicana de Óptica, A. C. (The Mexican Optical Academy and also the Mexico Territorial Committee for Optics of the International Commission for Optics), in partnership with the Mexican public research centers together with the public and private higher education institutions; designed to provide the Mexican optics and photonics community´s recent outstanding research results with international visibility. a. Plenary sessions, given by internationally recognized speakers in trend topics of the higher worldwide interest and impact in optics and photonics. b. Oral sessions, where Mexican invited speakers, as well as a selection of contributed papers authors, present their most recent and relevant research results; thus integrating a representative sample of the quality and impact of the optics and photonics science and technology currently under development in Mexico. c. Poster sessions, with a selection of peer-reviewed contributions, scheduled in order to foster the networking and establishment of well focused collaborations among Mexican optics and photonics research groups, and with their foreign counterparts. If you want to learn about what is currently being done in Mexico in the fields of optics and photonics, or are interested in establishing collaboration with a Mexican research group, then the Mexican Optics and Photonics Meeting is the must-to-attend conference!. 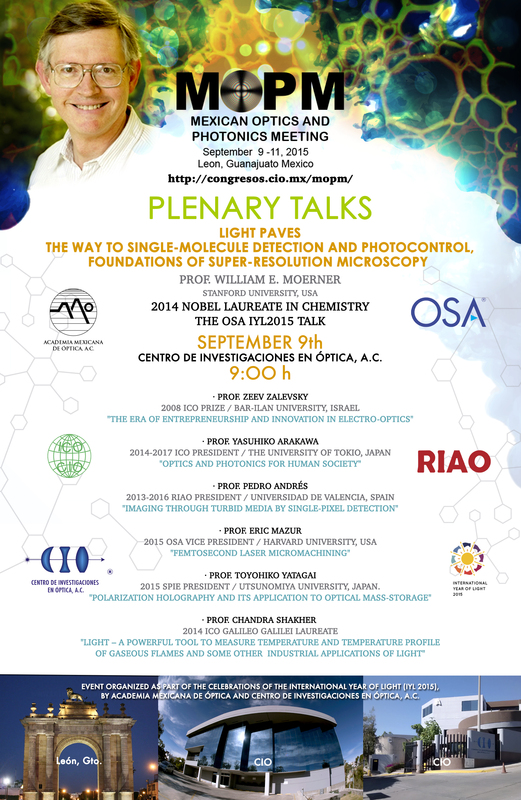 In this year edition, the Mexican Optics and Photonics Meeting will be joining the worldwide celebration of the “International Year of Light and Light-based Technologies, 2015” with special activities and highly recognized speakers, so mark it now in your calendar (September 9-11, 2015) and do not miss it!